Every day uncontaminated soil in the size of 30 soccer fields is re-sealed and destroyed. 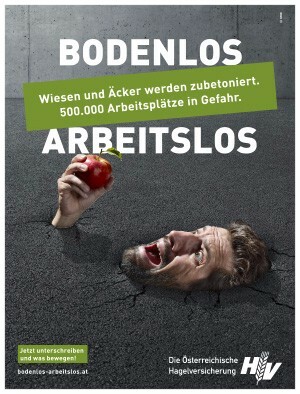 The consequences of steadily increasing obstruction concern all Austrians, according to the Österreichische Hagelversicherung (Austrian Hail Insurance). Since the sealed soils can no longer store water, this leads to floods and high tide, but also to drought. Hence, the company presented its latest signing campaign against excessive land use in Salzburg on 24th of August 2017. If the development continues as before, Austria has no more agricultural areas in 200 years. Around 500,000 jobs in and around agriculture are at risk. 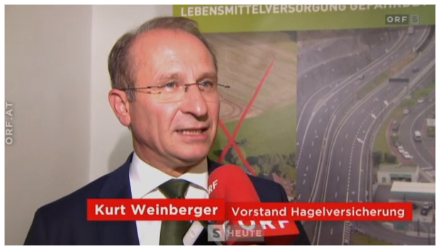 In addition, Austria would become unattractive for tourists due to the destruction of the countryside, according to Kurt Weinberger, the chairman of the Österreichischen Hagelversicherung, who is also represented in the IRE-Economic Board. Mainly due to storms and floods, the insurance company expects this year a loss of 200 million Euros. Meadow, forest or farmland, which was once installed, is irretrievably destroyed, according to Weinberger. It should not be built on the outskirts of towns and cities but in the core areas: ”This also means a condensation in the city. This ultimately leads to the fact that we can spare the most important basis for life, ‘soil’”, Weinberger continued. If nothing will be changed, an area as large as the entire city of Salzburg will be re-concreted every year in Austria, warns CEO Weinberger, who will address this problem as a panelist at this year’s IRE Conference of European Regions and Cities in September 2017. The Chairman of the Board of Management looks positively towards the ‘Master Plan for Rural Areas’, in which a considerably lower new conversion is provided. Environment Minister Andrä Rupprechter will hold a highly-topical speech at the 13th Conference of European Regions and Cities, organized by the IRE from 24th until 26th of September 2017 in Salzburg, where he will address this subject matter.